The 49ers appear to have a new punter. Justin Vogel agreed to terms on a 49ers deal, Matt Maiocco of NBC Sports Bay Area notes (via Twitter). 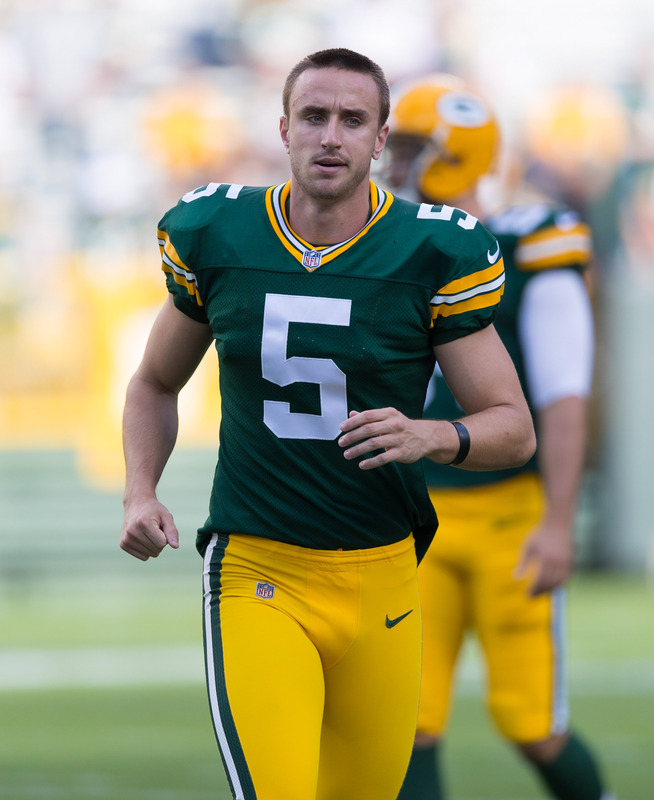 Vogel did not play in 2018 but was the Packers’ punter as a rookie in 2017. That remains his only NFL work. The 49ers, though, will give him a chance to earn their job. They did not bring back Bradley Pinion, who is now the Buccaneers’ punter. A Pro Bowl alternate after that 2017 season, Vogel traversed the NFL’s workout circuit in 2018. The Packers waived him last offseason, and the Browns followed suit after claiming him. Vogel, 25, averaged 44.4 yards per punt in 2017 — 24th in the league that season. Pinion served as San Francisco’s punter from 2015-18. He averaged 44 yards per boot in 2016 but did not eclipse that threshold in his other seasons. The Browns have swapped a quarterback for a special teamer. Cleveland claimed punter Justin Vogel off waivers from the Packers today. To make room on the roster, the team has waived quarterback Joel Stave. After selecting J.K. Scott during last week’s draft, the Packers waived Vogel on Friday. The 24-year-old joined the organization last season as an undrafted free agent out of Miami, and he proceeded to appear in all 16 games. He finished the campaign averaging 44.4 yards per attempt, with a net average of 41 yards. He also landed 19 of his 71 punts inside of the 20-yard line. Cleveland is seemingly setting up a punter competition, as the team is also rostering Britton Colquitt. Stave, a former standout at Wisconsin, has bounced around the league since going undrafted in 2016. He’s had brief stints with the Vikings, Seahawks, Chiefs, Redskins, Jets, and Browns. Cleveland is now rostering three signal-callers in Tyrod Taylor, Baker Mayfield, and Drew Stanton. Here are Friday’s draft signings. On the same day the Packers cut Justin Vogel, their 2017 punter, they signed fifth-round pick J.K. Scott. Vogel requested to be waived, Rob Demovsky of ESPN.com tweets, because of the odds seemingly stacked against him to win the Green Bay job against a highly (for a punter) drafted rookie rather than catching on elsewhere before a training camp begins. This clears the way for Scott, whom the Packers selected at No. 172 overall out of Alabama. Green Bay also signed the long snapper drafted in the seventh round, Hunter Bradley, who played at Mississippi State. The Jets signed sixth-round running back Trenton Cannon on their first day of rookie minicamp. Cannon played at Division II Virginia State. The Seahawks also announced they signed draft picks Will Dissly, Jacob Martin and Michael Dickson. Dissly will stay in Seattle after playing at the University of Washington. The Seahawks selected the blocking tight end in the fourth round. One of the six linebackers Seattle either drafted or signed as a UDFA, Martin arrived in the sixth round out of Temple. Dickson (Texas) ended up as the first punter drafted this year, going off the board at No. 149. The Packers are making a change at punter. After drafting punter J.K. Scott in the fifth round of this year’s draft, they waived Justin Vogel on Friday, a source tells Adam Schefter of ESPN.com (on Twitter). Vogel signed with the Packers last year as an undrafted free agent and beat out Jacob Schum for the punting job. In 2017, he averaged 44.4 yards per attempt, with a net average of 41 yards. He also put 19 of his 71 punts inside of the 20-yard line. Vogel is not considered to be on the same level as punters like Johnny Hekker of the Rams or Marquette King of the Broncos (formerly of the Raiders), but he should be able to land a camp contract after a decent showing last year.